Artwork by actress/artist/designer Jane Seymour will be on exhibit at Maiani Gallery in Montecito, in Santa Barbara County, California. The exhibition opens with an invite only VIP reception with Jane Seymour on Friday, February 19, 2010. The exhibition continues through March 5, 2010. The artwork is available for purchase, before, during and after the reception and Jane Seymour will personalize your purchase. Contact the gallery for more information. 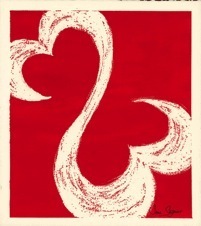 Jane Seymour's painting "Snowy Open Hearts II- Vancouver 2010 Compete With An Open Heart" (shown below) has been selected by the International Olympic Committee to represent the US athletes in the Vancouver 2010 Winter Olympics. A portion of sales from this image will be donated to the US athletes. There is also a poster based on the painting available at the The Official Team USA Olympic Shop.